Aripiprazole (Abilify, Abilify Discmelt) is an atypical antipsychotic and antidepressant used in the treatment of schizophrenia, bipolar disorder, and clinical depression. It was approved by the Food and Drug Administration (FDA) for schizophrenia on November 15, 2002, for acute manic and mixed episodes associated with bipolar disorder on October 1, 2004, and as an adjunct for major depressive disorder on November 20, 2007. Aripiprazole was developed by Otsuka in Japan, and in the United States, Otsuka America markets it jointly with Bristol-Myers Squibb. Aripiprazole has been approved by the FDA for the treatment of acute manic and mixed episodes, in both pediatric patients aged 10-17 and in adults. Several double-blind, placebo-controlled trials support this use. In addition, it is often used as maintenance therapy, either on its own or in conjunction with a mood stabilizer such as lithium or valproate. This use is also supported by a handful of studies. Aripiprazole is at least as effective as haloperidol at reducing manic symptoms, and is much better tolerated by patients. Aripiprazole's use as a monotherapy in bipolar depression is more controversial. While a few pilot studies have found some effectiveness (with one finding a reduction in anhedonia symptoms), two large, double-blind, placebo-controlled studies found no difference between aripiprazole and placebo. One study reported depression as a side effect of the drug. Aripiprazole's mechanism of action is different from those of the other FDA-approved atypical antipsychotics (e.g., clozapine, olanzapine, quetiapine, ziprasidone, and risperidone). 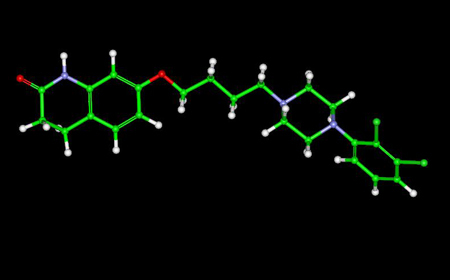 Rather than antagonizing the D2 receptor, aripiprazole acts as a D2 partial agonist. Aripiprazole is also a partial agonist at the 5-HT1A receptor, and like the other atypical antipsychotics displays an antagonist profile at the 5-HT2A receptor. Aripiprazole has moderate affinity for histamine and Î±-adrenergic receptors and for the serotonin transporter, and no appreciable affinity for cholinergic muscarinic receptors. Aripiprazole also acts as a 5-HT2C partial agonist, which may underly the minimal weight gain seen in the course of therapy. D2 and D3 receptor occupancy levels are high, with average levels ranging between ~71% at 2 mg/day to ~96% at 40 mg/day. Most atypical antipsychotics bind preferentially to extrastriatal receptors, but aripiprazole appears to be less preferential in this regard, as binding rates are high throughout the brain. Aripiprazole displays linear kinetics and has an elimination half-life of approximately 75 hours. Steady-state plasma concentrations are achieved in about 14 days. Cmax (maximum plasma concentration) is achieved 3â€“5 hours after oral dosing. Bioavailability of the oral tablets is about 90% and the drug undergoes extensive hepatic metabolization (dehydrogenation, hydroxylation, and N-dealkylation), principally by the enzymes CYP2D6 and CYP3A4. Its only known active metabolite is dehydro-aripiprazole, which typically accumulates to approximately 40% of the aripiprazole concentration. The parenteral drug is excreted only in traces, and its metabolites, active or not, are excreted via feces and urine. Otsuka's US patent on aripiprazole expires on October 20, 2014; however, due to a pediatric extension, a generic will not become available until at least April 20, 2015. Barr Laboratories (now Teva Pharmaceuticals) initiated a patent challenge under the Hatch-Waxman Act in March 2007. This challenge is still in court as of 14 August 2009. Common side effects: Akathisia, headache, unusual tiredness or weakness, nausea, vomiting, an uncomfortable feeling in the stomach, constipation, light-headedness, insomnia, sleepiness, shaking, and blurred vision. Uncommon side effects: Uncontrollable twitching or jerking movements, tremors, seizure, and weight gain. Some people may feel dizzy, especially when getting up from a lying or sitting position, or may experience a fast heart rate. Other elderly patients may experience high blood sugar or the onset or worsening of diabetes. Very rare side effects: Allergic reaction (such as swelling in the mouth or throat, itching, rash), increased production of saliva, speech disorder, nervousness, agitation, fainting, reports of abnormal liver test values, inflammation of the pancreas, muscle pain, weakness, stiffness, or cramps. Aripiprazole is a substrate of CYP2D6 and CYP3A4. Coadministration with medications that inhibit (e.g. paroxetine, fluoxetine) or induce (e.g. carbamazepine) these metabolic enzymes are known to increase and decrease, respectively, plasma levels of aripiprazole. As such, anyone taking Abilify should be aware that their dosage of Abilify may need to be decreased. Aripiprazole may change the subjective effects of alcohol. One study found that aripiprazole increased the sedative effect and reduced the sense of euphoria normally associated with alcohol consumption. However, another alcohol study found that there was no difference in subjective effect between a placebo group and a group taking aripiprazole. ^ Hitti, Miranda (20 November 2007). "FDA OKs Abilify for Depression". WebMD. http://www.webmd.com/depression/news/20071120/fda-oks-abilify-for-depression. Retrieved 8 December 2008. ^ a b "Patent and Exclusivity Search Results". Electronic Orange Book. US Food and Drug Administration. http://www.accessdata.fda.gov/scripts/cder/ob/docs/patexclnew.cfm?Appl_No=021436&Product_No=001&table1=OB_Rx. Retrieved 8 December 2008. ^ Keck PE, Marcus R, Tourkodimitris S, Ali M, Liebeskind A, Saha A, Ingenito G (September 2003). "A placebo-controlled, double-blind study of the efficacy and safety of aripiprazole in patients with acute bipolar mania". Am J Psychiatry 160 (9): 1651-8. http://ajp.psychiatryonline.org/cgi/pmidlookup?view=long&pmid=12944341. ^ Sachs G, Sanchez R, Marcus R, Stock E, McQuade R, Carson W, Abou-Gharbia N, Impellizzeri C, Kaplita S, Rollin L, Iwamoto T (July 2006). "Aripiprazole in the treatment of acute manic or mixed episodes in patients with bipolar I disorder: a 3-week placebo-controlled study". J. Psychopharmacol. (Oxford) 20 (4): 536-46. ^ Vieta E, T'joen C, McQuade RD, Carson WH, Marcus RN, Sanchez R, Owen R, Nameche L (October 2008). "Efficacy of adjunctive aripiprazole to either valproate or lithium in bipolar mania patients partially nonresponsive to valproate/lithium monotherapy: a placebo-controlled study". Am J Psychiatry 165 (10): 1316-25. ^ Keck PE, Orsulak PJ, Cutler AJ, Sanchez R, Torbeyns A, Marcus RN, McQuade RD, Carson WH (January 2009). "Aripiprazole monotherapy in the treatment of acute bipolar I mania: a randomized, double-blind, placebo- and lithium-controlled study". J Affect Disord 112 (1-3): 36-49. ^ Keck PE, Calabrese JR, McIntyre RS, McQuade RD, Carson WH, Eudicone JM, Carlson BX, Marcus RN, Sanchez R (October 2007). "Aripiprazole monotherapy for maintenance therapy in bipolar I disorder: a 100-week, double-blind study versus placebo". J Clin Psychiatry 68 (10): 1480-91. ^ Keck PE, Calabrese JR, McQuade RD, Carson WH, Carlson BX, Rollin LM, Marcus RN, Sanchez R (April 2006). "A randomized, double-blind, placebo-controlled 26-week trial of aripiprazole in recently manic patients with bipolar I disorder". J Clin Psychiatry 67 (4): 626-37. ^ Young AH, Oren DA, Lowy A, McQuade RD, Marcus RN, Carson WH, Spiller NH, Torbeyns AF, Sanchez R (January 2009). "Aripiprazole monotherapy in acute mania: 12-week randomised placebo- and haloperidol-controlled study". Br J Psychiatry 194 (1): 40-8. ^ Vieta E, Bourin M, Sanchez R, Marcus R, Stock E, McQuade R, Carson W, Abou-Gharbia N, Swanink R, Iwamoto T (September 2005). "Effectiveness of aripiprazole v. haloperidol in acute bipolar mania: double-blind, randomised, comparative 12-week trial". Br J Psychiatry 187: 235-42. ^ Mazza M, Squillacioti MR, Pecora RD, Janiri L, Bria P (December 2008). "Beneficial acute antidepressant effects of aripiprazole as an adjunctive treatment or monotherapy in bipolar patients unresponsive to mood stabilizers: results from a 16-week open-label trial". Expert Opin Pharmacother 9 (18): 3145-9. ^ Dunn RT, Stan VA, Chriki LS, Filkowski MM, Ghaemi SN (September 2008). "A prospective, open-label study of Aripiprazole mono- and adjunctive treatment in acute bipolar depression". J Affect Disord 110 (1-2): 70-4. ^ Mazza M, Squillacioti MR, Pecora RD, Janiri L, Bria P (January 2009). "Effect of aripiprazole on self-reported anhedonia in bipolar depressed patients". Psychiatry Res 165 (1-2): 193-6. ^ Thase ME, Jonas A, Khan A, Bowden CL, Wu X, McQuade RD, Carson WH, Marcus RN, Owen R (February 2008). "Aripiprazole monotherapy in nonpsychotic bipolar I depression: results of 2 randomized, placebo-controlled studies". J Clin Psychopharmacol 28 (1): 13-0. ^ Muzina DJ, Momah C, Eudicone JM, Pikalov A, McQuade RD, Marcus RN, Sanchez R, Carlson BX (May 2008). "Aripiprazole monotherapy in patients with rapid-cycling bipolar I disorder: an analysis from a long-term, double-blind, placebo-controlled study". Int. J. Clin. Pract. 62 (5): 679-87. ^ Lawler CP et al. (1999). "Interactions of the novel antipsychotic aripiprazole (OPC-14597) with dopamine and serotonin receptor subtypes". Neuropsychopharmacology 20 (6): 612, Ma J, Wong S, Gao Y, Pham E, Knapp AE, Nash NR, Olsson R, Davis RE, Hacksell U, Weiner DM, Brann MR (December 2005). "Intrinsic Efficacy of Antipsychotics at Human D2, D3, and D4 Dopamine Receptors: Identification of the Clozapine Metabolite N-Desmethylclozapine as a D2/D3 Partial Agonist". J Pharmacol Exp Ther 315 (3): 1278â€“87. ^ Stark, AD et al. (2007). "Interaction of the novel antipsychotic aripiprazole with 5-HT1A and 5-HT2A receptors: functional receptor-binding and in vivo electrophysiological studies". Psychopharmacology (Berl) 190 (3): 373-382. ^ Shapiro, DA et al. (2003). "Aripiprazole, A Novel Atypical Antipsychotic Drug with a Unique and Robust Pharmacology". Neuropsychopharmacology 28 (8): 1400-1411. ^ a b "Abilify (Aripiprazole) - Clinical Pharmacology". DrugLib.com. 14 February 2007. http://www.druglib.com/druginfo/abilify/pharmacology/. Retrieved 8 December 2008. ^ Zhang JY, Kowal DM, Nawoschik SP, Lou Z, Dunlop J (February 2006). "Distinct functional profiles of aripiprazole and olanzapine at RNA edited human 5-HT2C receptor isoforms". Biochem Pharmacol 71 (4): 521-9. ^ Kegeles, LS et al. (2008). "Doseâ€“Occupancy Study of Striatal and Extrastriatal Dopamine D2 Receptors by Aripiprazole in Schizophrenia with PET and [18F]Fallypride". Neuropsychopharmacology 33 (13): 3111-3125. ^ Yokoi F, GrÃ¼nder G, Biziere K, Stephane M, Dogan AS, Dannals RF, Ravert H, Suri A, Bramer S, Wong DF (August 2002). "Dopamine D2 and D3 receptor occupancy in normal humans treated with the antipsychotic drug aripiprazole (OPC 14597): a study using positron emission tomography and [11C]raclopride". Neuropsychopharmacology 27 (2): 248-59. ^ "In This Issue". Am J Psychiatry 165 (8): A46. August 2008. ^ Barr Pharmaceuticals, Inc. (2007-03-20). "Barr Confirms Filing an Application with a Paragraph IV Certification for ABILIFY(R) Tablets". Press release. http://phx.corporate-ir.net/phoenix.zhtml?c=60908&p=irol-newsArticle&ID=975763&highlight=. Retrieved 2008-12-23. ^ Abbasian C, Power P (March 2009). "A case of aripiprazole and tardive dyskinesia". J Psychopharmacol (Oxford) 23 (2): 214-5. ^ Zaidi SH, Faruqui RA (January 2008). "Aripiprazole is associated with early onset of Tardive Dyskinesia like presentation in a patient with ABI and psychosis". Brain Inj 22 (1): 99-102. ^ Maytal G, Ostacher M, Stern TA (June 2006). "Aripiprazole-related tardive dyskinesia". CNS Spectr 11 (6): 435-9. ^ "Abilify (Aripiprazole) - Warnings and Precautions". DrugLib.com. 14 February 2007. http://www.druglib.com/druginfo/abilify/warnings_precautions/. Retrieved 8 December 2008. ^ Kranzler, Henry R. et al. (2008). "Effects of Aripiprazole on Subjective and Physiological Responses to Alcohol". Alcoholism: Clinical and Experimental Research 32 (4): 573-579. ^ Konstantin Voronin, Patrick Randall, Hugh Myrick, Raymond Anton (2008). "Aripiprazole Effects on Alcohol Consumption and Subjective Reports in a Clinical Laboratory Paradigm Possible Influence of Self-Control". Alcoholism: Clinical and Experimental Research 32 (11): 1954-1961.